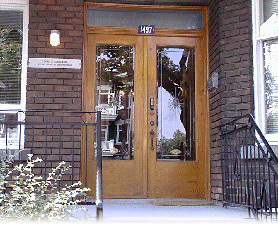 Our offices are located in Montreal, on the Plateau Mont-Royal, at 1497 Boulevard. St-Joseph East, at the intersection of Fabre Street. Please take note that we are a private office and our services are only offered by appointment. Orange line: Laurier station, exit St-Joseph, 27 bus, get off on Boul. St-Joseph and Fabre intersection OR walk to our office, for approximately 15 minutes. Blue line: Fabre station, 45 bus, get off on Boul. St-Joseph/Papineau intersection. Green line: Papineau station, 45 bus, get off on Boul. St-Joseph/Papineau intersection. Parking is allowed on St-Joseph Blvd. except during rush hours. It is also possible to park on lateral streets.